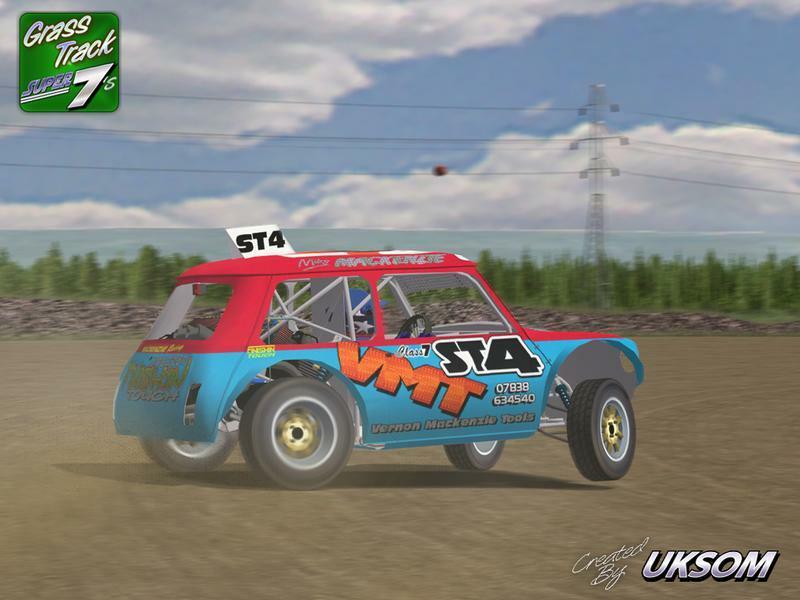 UKSOM are pleased to announce the release of Grasstrack Super Sevens, this mod has actually been out for about a year on our website but someone reminded me to update it on here so apologies all round! 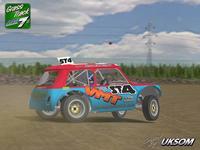 The mod is based on the Grasstrack Class 7’s and are powered by a varirty of engines. Single and Twin Bike engines, Large capacity multivalve 4 cylinders, Turbo’s and V8’s. Cars include Mini, Mini Pickup, Fiat Seicento, Fiat Cinqechento and Suzuki SC100. The mod also includes 5 tracks: Pennine, Evesham, York, Scunthorpe and a field track in the Netherlands which has been retrofitted with a straight line start for Grass track use. Car selection has a basic roster of drivers made up of skins from the mod team and a few real life drivers as well. We will release a update with more real life skins depending on interest, we need this to be a community based effort however and we will need help with this. If you are interesting in painting a skin for the mod , please post in the forum. We will set up a thread for skin submissions. There are some important points you need to read about this mod. This is intended to be an ONLINE MULTIPLAYER ONLY mod. The AI/Computer controlled vehicles just will not work properly despite our best efforts. You are more than welcome to try them out with the AI but they go totally nuts each time. This is just meant to be a fun mod that people can have good fun racing with. We don’t proclaim that it’s the most accurate mod because nothing ever will be but we just hope people enjoy racing it in the right manner and have a good laugh with it. Class 5’s which are 1400 cc based spaceframe smaller siblings of the Sevens are also incorporated into the Super Seven mod along with 5 tracks. Many thanks to all involved in the creation of this mod, and also to the top guys at trellet.net for the use of their bike engine sounds from the legend mod. Their superb mod is available here https://www.rfactorcentral.com/detail.cfm?ID=Legends%20Cars. There are currently no setups for Grasstrack Super Sevens. Add a Setup. When can we expect this mod to be released. I can't wait to get my hands on it.